Canadian Noah Millman teaches at Leiden University and would use his last 24 hours in the Netherlands to visit the Efteling amusement park. In late 2006 I was looking for a highly rated master’s programme in my field and several universities in The Netherlands caught my attention. I applied, and here I am. Somewhere between immigrant and international/expat. I’m not an immigrant because I’d like to keep my Canadian citizenship and dual nationality is not allowed. For me expat and international are the same and I see myself more closely related to this category. I do not have a current plan to leave. The dreaded question. I have taken three Dutch courses, but living in Amsterdam there aren’t many opportunities to practice as the English level here is incredible and there are so many internationals. My accented Dutch is often met with English responses, so for the time being I am happy to understand, read and write in public and speak among friends. A guilty pleasure would be a broodje haring but standard Dutch fare is too deep fried for regular indulgence. I am a big fan of the many wonderful fusion and non-Dutch restaurants in Amsterdam, however. Evening shopping hours, sinus medication and a responsive customer care industry. I believe I have retained most of my Canadian-isms, but I have embraced offering up a healthy dose of bluntness every now and then. 1) Pre-buy museum tickets. There is no better feeling than walking right past a giant queue. 2) Blend in. As much as Amsterdam is perceived as a tourist city, the people here don’t like tourists. So: A) Don’t rent a bike that is a specific colour (red, yellow, green, orange). B) Just finished the Heineken Experience and bought a few things? That green bag screams ‘charge me more’ when you walk through the market; put it in a backpack. C) Nobody living in Amsterdam wears a hat that says AMSTERDAM with marijuana leaves on it, save that for home. A lot of famously liberal/tolerant/relaxed policies are only legend. It is much stricter and more regulated than I could have ever imagined. Morning: Efteling. Evening: Walk through Amsterdam, take a boat out on the canals. Late Night: Visit one of Amsterdam’s legendary night life locations like Boom Chicago, Paradiso or Sugar Factory for some Wicked Jazz Sounds. 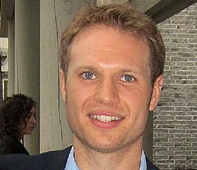 Noah Millman, 31, is completing a PhD in psychology of religion and teaches at Leiden and Amsterdam University.